Thank you for all your comments about the Ghana dress! It was one of those projects that turned out better than I expected and I can't wait to start wearing it. I took a break from the sewing machine on Saturday because I couldn't resist the warm weather. It was also a chance to wear my latest wardrobe garments. A walk to the grocery store with my husband was followed by an impromptu picnic. 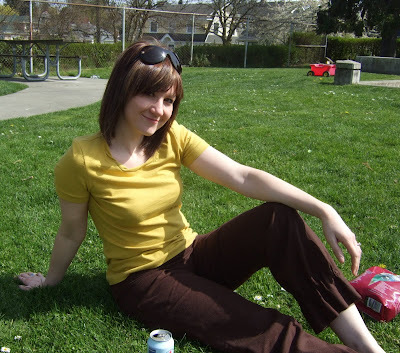 My outfit was just the right kind of comfortable for sitting in the grass, drinking Aranciata, and people watching. Last year, Liana posted a great tutorial on how to create a twisted neck binding - who knew it was so easy? I started with a basic t-shirt pattern (BWOF 2-2005-114 with the v-neck altered to be round, the same pattern I used for my stuffed neckband tee). Cotton jersey in mustard yellow from my trip to G Street with Cidell. This became super soft after I washed it. I drew lines about 3/4" apart on the wrong side of the binding as a guideline, then pinned the top raw edge of the band to the bottom raw edge of the band, wrong sides together, matching the top of each marking with the bottom of the one next to it. I love this! It's subtle but interesting. Also check out Sigrid's twisted neckline t-shirt - I love how hers looks with the wide band - very fashiony. 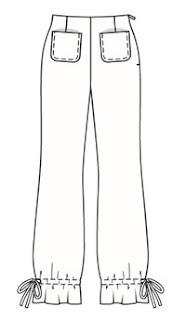 I removed about an inch lengthwise because I've found that Burda pants tend to be a bit long on me. The casing at the bottom of the leg is formed by cutting the leg extra long, turning up the hem, and sewing two parallel lines. 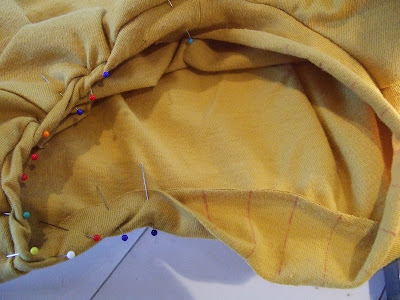 Buttonholes at the side seam allow the drawstrings to pass through. Burda tells you to use purchased "seam tape" for the drawstrings. I couldn't figure out what this was, so I made the drawstrings myself. Finally I realized that they meant for you to use "twill tape". This is exactly my style of summer pant. I'll get a lot of use out of these. My fly front Bermuda shorts are also done! I'll share those with you soon. Right now I'm off to finish the final piece for the wardrobe - a handbag. It is a perfect summer outfit! I'll have to try the twisted neckband someday. Thanks for posting the tutorial! What a great comfy/casual outfit! I love those pants. I hate I missed that issue. LOVE the twisted neckline, you look great in your top! wow you are on a roll!! Me likey those drawstring pants. I will also have to try out that technique as it is so ingenious!!! Ahh...and the impromptu picnic is so cool. Can't beat that! Great outfit! Just perfect for the summer! OH! I didn't notice those pants!!! I love them!! I might have to put that on my list for summer! Fantastic outfit, Christina! Love this picture. I am amazed at how much sewing you achieve - and quality sewing, too. You truly rock! Cute outfit - like Adrienne, I missed those pants, too. Now, I have to go find that issue of WOF. That outfit looks so comfortable! And love the neckline. I'll have to try that neckband too! could you be more adorable? What a great a little outfit! Neat outfit. The twisted neck band adds great interest to the t-shirt. I can't wait to see the handbag. Love the outfit, and look at you sew! I feel like such a slacker. Ok, got to get act together. Great outfit and I love the capris! The twisted neckline idea has been simmering in my brain for ages but I think you have pushed me over the edge to try it. I keep seeing it everywhere so I think that's a sign. :) Enjoy the warm weather. Cute outfit. I love that the blogs are showing the coming of summer, woohoo, summer sewing here we come! Very nice casual outfit. I must try that neckline on a T too. I just love everything you make. If my husband does not get me a Burda subscription in June (my birthday), I'll be getting one myself. 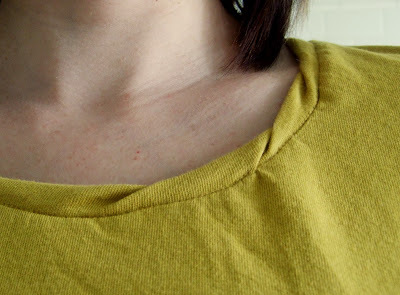 Who knew a twisted neckband could be so easy?! Great outfit! Your wardrobe is really coming together! Super adorable. And I love the color of the fabric for the tee. Fabulous! You are building up a fabulous wardrobe and you are doing it fast and well!!!! I am so stealing that neckband idea. If I walked into neiman's right now I'm sure I would see a $60 t-shirt with the same detail. Great outfit and wasn't that some lovely weather on Saturday? Sure could use a big more of that! Can't believe how fast you're cranking out these garments! Glad you were able to take advantage of the sunny weather...it was back to the usual grey and rainy skies today. The weather is seriously starting to get to me! Love the outfit, very cute! And the yellow/chocolate combination is yummy!